Impress Your Friends With –Marshmallows! Seriously, I never thought about actually making homemade marshmallows until someone gave us some handmade ones for Christmas a few years ago. They were peppermint flavored and they came from a boutique shop and they were awesome! From that moment on I thought, “If they don’t only come in a bag from the grocery store, and they can be flavored, and they can taste this much better than the ones I grew up eating, why can’t I make them? !” So, I finally got serious about finding a recipe that seemed simple enough and getting brave enough to try it. And guess what? They’re EASY. Yes, you heard me right. EASY. There are a number of recipes out there on the web, so I picked one from someone who usually makes things that work for me and went from there. I wanted to add flavors, but I started out with the original basic recipe and didn’t change anything the first time, so that if anything went wrong later I would know that the change was the problem (yes, I am a former science teacher). However, not to worry. No problems, easy and impressive. Messy, but really, nothing really worth doing isn’t messy. You still have time to make some for a last minute gift that will please virtually anyone, or to serve at your own Christmas or New Years party, or just to make to indulge yourself. My husband gives them a big thumbs up. I’ve made at least 4 batches so far. OK, enough chit chat. 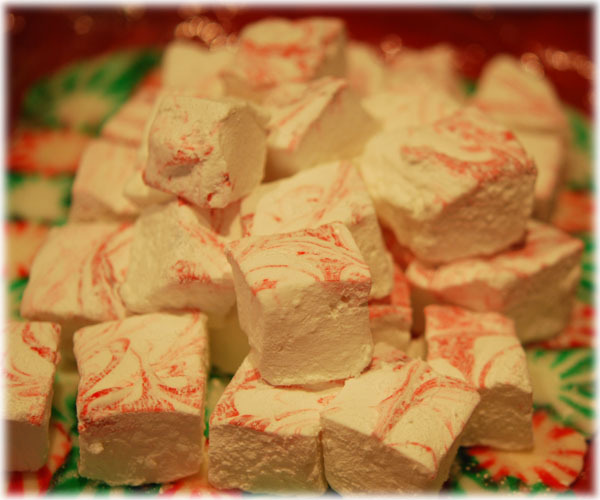 The recipe is at Peppermint and Cinnamon Marshmallows. Check it out!